Last month, I sat in the back of a meeting room at the MAH and watched something extraordinary happen. Our county board of supervisors had brought their official meeting to the museum. They were off-site for the first time in years, holding a special study session sparked by an exhibition about foster youth, Lost Childhoods. The supervisors toured the exhibition with some of the 100+ local partners who helped create it. Then, for an hour, former foster youth who helped design the exhibition shared their stories with supervisors. They spoke powerfully and painfully about their experiences. They shared their hopes. They urged the politicians to fix a broken system. It felt like something opened up, right in that room, between the flag and the tissues and the microphones. It felt like change was breaking through. This was not an event orchestrated by the MAH. It happened because two of our Lost Childhood partners urged it into being. They negotiated with the County. They set the table. They made something real and meaningful happen. They did it because the exhibition belonged to them. They helped conceive it, plan it, and build it. The Lost Childhoods exhibition is a platform for 100+ partners to share their stories, artwork, ideas, projects, volunteer opportunities, and events. Nine years ago, I wrote a post called The Future of Authority: Platform Power. In it, I argued that museums could give up control of the visitor experience while still maintaining (a new kind of) power. Museums could make the platforms for those experiences. There is power IN the platform--power to shape the way people participate. This argument became one of the foundations of The Participatory Museum. Nine years later, I still believe this. Now that I run a museum, I experience the variety of ways we can create platforms that empower community members to do certain things, in certain ways, that amplify the institution. The power IN the platform is real. But I've also become reenergized about the power OF the platform for those community members who participate. I value platforms for their power to scale impact. Traditionally, museums and cultural organizations offer programs. Staff produce them for, and sometimes with, visitors. Each program has a fixed cost, and expanding that program means expanding that cost. If it takes a staff member 5 hours to run a screen-printing workshop, it takes her ten hours to run it twice. Even a smash hit program is hard to scale up in this model. At the MAH, we've tried wherever possible to break out of unidirectional program models. We believe that we can most effectively empower and bridge community members (our strategic goal) if we invite them to share their skills with each other. This is the participatory platform model. Instead of staff running workshops, our staff connect with local printmaking collectives. We ask them what their goals are for outreach and community connection. And then we support and empower them to lead workshops and festivals and projects on our site. Instead of "doing the thing" directly, our staff make space for community members to do the thing--and to do so beautifully, proudly, with and for diverse audiences. Does this work scale better than programs? It's not always obvious from the start whether it will. This work is relationship-heavy, and those relationships take time to build. When we created an exhibition with 100 community members impacted by the foster care system, it took almost a year to recruit, convene, open up, explore, and create the products and the trust to build those products well. But that investment in building a platform paid off. When you build relationships in a platform, you build participants' power. Platforms can accommodate lots of partners and support them taking the projects in new directions. Since opening in July, exhibition partners haven't just planned a County supervisors' meeting. They've led over 50 exhibition-related community events at and beyond the MAH. They've created powerful learning experiences, diverse audiences, and new program formats. Our staff could never produce all this activity on our own. We put our energy into empowering partners, which ignited their passion and ability to extend the exhibition to new people and places. Whereas a program is a closed system, a platform is an open one. In a platform model, more is not more staff time and cost. More is more use of the platform, more participants empowered to use it to full potential. As our organization grows, we are looking for more ways to adopt a platform mindset. Now that we've opened Abbott Square, we have a goal to offer free cultural programming almost every day of the week. This means a huge shift for the MAH (previously we offered 2 monthly festivals plus a few scattered events). How will we increase our event offerings so aggressively? We're not planning to do it by adding a lot of staff to programming the space. We're planning to do it by building new platforms. We are learning from our "monthly festival" platform and building a lightweight, more flexible version. We want to make it easier for community groups to plug in, offering their own workshops and festivals and events, with our support. If we can create the right platform for daily events, it serves our community, by giving them the support, space, and frequent events they desire. It advances our theory of change, by empowering locals and bridging their diverse communities. And it puts the MAH at the center of the web of activity, as a valued partner and platform provider. Building platforms is not the same as building programs. It flexes new muscles, requires different skill sets. But to me, the benefit is clear. 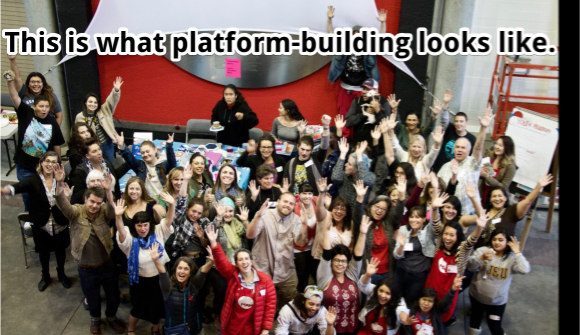 In a platform model, our community takes us further than we could ever go on our own.